Maala lies on the Southern side of Aden Harbour, halfway between the Steamer Point and Crater on the main road south of Khormaksar Airport. The Cemetery is located south of the main road to Crater. Within the cemetery, on the central avenue beyond the Cross of Sacrifice, stand the Maala Memorials. 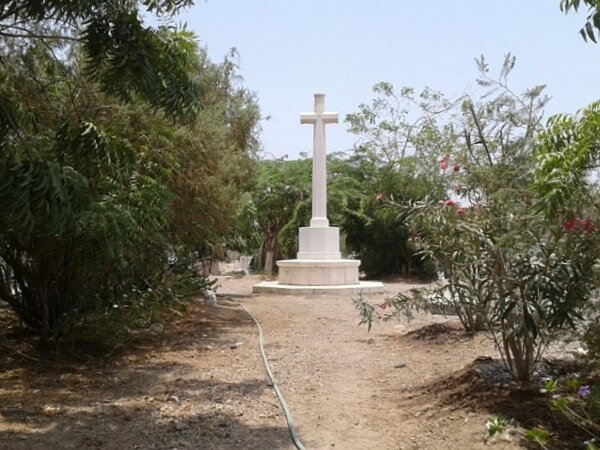 Most of the 145 Commonwealth servicemen of the 1914-1918 War buried here lost their lives in the defence of Aden against the Turks. 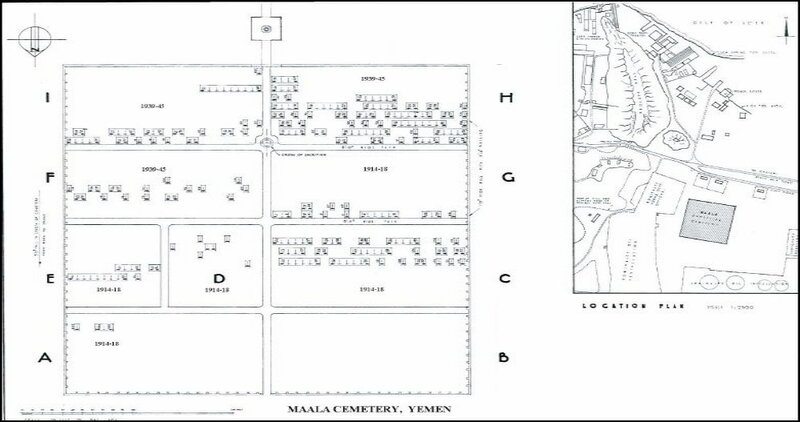 There are 157 Commonwealth war burials of the 1939-1945 War in Maala Cemetery. 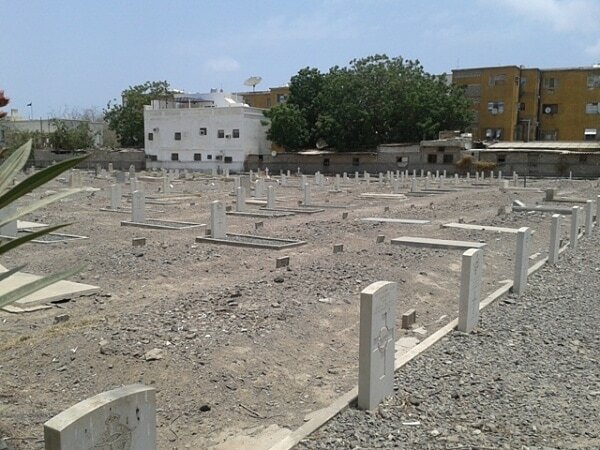 Most of those buried in other parts of Yemeni territory, whose graves could not be maintained, were later transferred to this cemetery. Aden was a naval and air base of vital importance during the war. There are 11 Non Commonwealth war burials and 379 Non World War service burials named here. The cemetery is surrounded on four sides by a wall. The entrance, on the northern side, leads to the central avenue, and half-way along stands the Cross of Sacrifice at the intersection of two paths. The war graves, which are scattered in the different denominational plots among those of civilians, are marked by headstones or private memorials and surrounded by kerbs filled with coral chippings. Many of the graves of the 1914-1918 War have also been kerbed in conformity with the general design of the cemetery. The Maala Memorials stand on the central avenue, beyond the Cross of Sacrifice, in Maala Cemetery, which is located south of the main road to Crater. 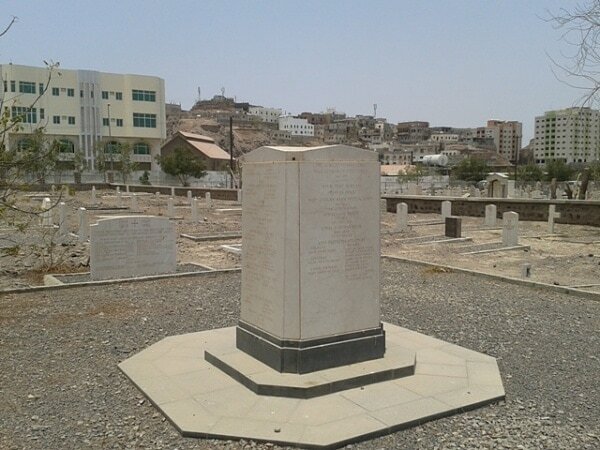 Maala Memorial No.1 commemorates 65 soldiers who died in or near Yemen during the 1939-1945 War; 33 men of the Indian Forces who were cremated, and 32 who lie buried in graves which could not be located or maintained, of whom 27 soldiers belonged to the United Kingdom Forces and five to the Forces of East and West Africa and of Botswana, Lesotho and Swaziland. The names are inscribed on panels inserted on three sides of a stone pillar which forms part of a memorial seat and which also incorporates the Register box. A later extension on the western side, Maala Memorial No. 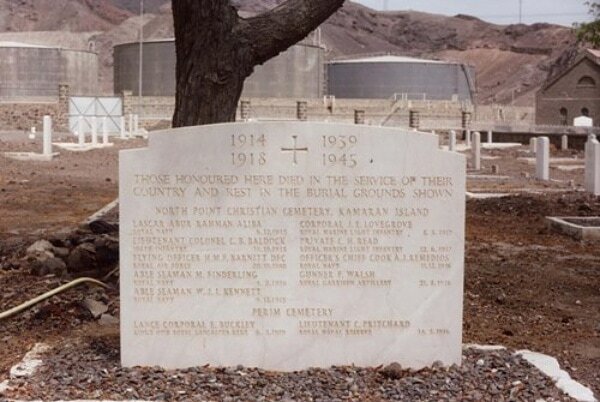 2, commemorates 10 servicemen of the 1914-1918 War and 1 airman of the 1939-1945 War who were buried at North Point Christian Cemetery, Kamaran Island and Perim Cemetery, Perim Island. Kamaran and Perim are remote places at the southern end of the Red Sea, and these eleven graves can no longer be maintained. The airman served with No. 203 Squadron, Royal Air Force, which was based at Aden at the outbreak of the 1939-1945 War. 19834 Lieutenant Colonel William John English, V. C.
Royal Ulster Rifles, died 4th June 1941, aged 59. Plot I. 21. 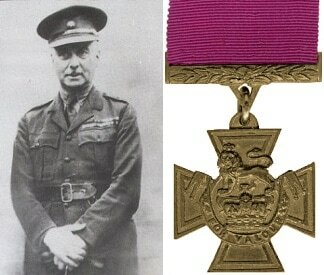 Son of Maj. William English, O.B.E. and Marian English; husband of Mary Isabel English, of Knock, Belfast, Northern Ireland. Also served in the 1914/18 War with the R.A.S.C. Citation: An extract from the "London Gazette," dated 4th Oct., 1901, records the following:- "On 3rd July 1901, Lt. W. J. English, Scottish Horse (Dragoons), with five men, was holding the right of a position at Vlakfontein during an attack by the Boers. When ammunition ran short he crossed some fifteen yards of open ground under heavy fire at short range and obtained more. Two of his men were killed and two wounded, but the position still held, largely owing to this officer's personal pluck."